The LG L40 rocks up as at the bottom of the Korean firm's mobile totem pole, taking over from 2013's rather disappointing LG Optimus L3 2. Previous L series handsets have been rather underwhelming, especially the entry level devices, but the third generation on show at MWC 2014 have more about them than their predecessors. The L40 still isn't going to blow you away in terms of specs, but it is at least a setup and the 3.5-inch screen now boasts a 320 x 480 resolution. Nothing special sure, but at least it's not a pixelated mess. The bigger issue is the size of the screen here, as 4 inches is fast becoming the minimum standard for our smartphones - gone are the times where 3.5-inch displays were mainstream, now they just feel cramped. That's the immediate feeling I got when I picked up the LG L40 - it's just too small. Of course I'm more used to playing with 5-inch devices, so making the jump down to 3.5 is always going to be a shock to the system. In terms of design the LG L40 isn't quite as well finished as its larger brothers, the L70 and L90, with a chunkier, more bezel heavy body reminiscent of smartphones from a few years ago. This hammers home the budget credentials of the L40, and couple that with a screen which clearly doesn't have an overly high resolution and this handset is fooling no one. It is a solid device though, and thanks to its diminutive stature the L40 nestles snugly into the palm, making it incredibly easy to hold. There are no onscreen navigations keys on show here - just as well considering its size - with LG opting to stick with the physical home buttons and touch sensitive back and menu keys of the previous L Series devices. LG has still furnished the L40 with a 1.2GHz dual-core processor, but only 512MB of RAM - however this is enough to run Google's latest mobile incarnation, Android 4.4 KitKat. In terms of performance the L40 is pretty smooth, partly thanks to KitKat's ability to harness 512MB of RAM effectively. It's not going to win any speed tests, but I was able to move around the handset with ease. The LG L40 even has the firm's new Knockcode feature, allowing you to create a security pattern with a series of knocks which simultaneously wakes and screen and unlocks the device. That tiny screen also means typing on the LG L40 is a little tricky, with the keyboard being rather cramped making it difficult to hit the right keys. There's a 3MP camera round the back of the LG L40, and it's all very much an average affair, from the basic options in the camera app to the quality of pictures you're able to take. 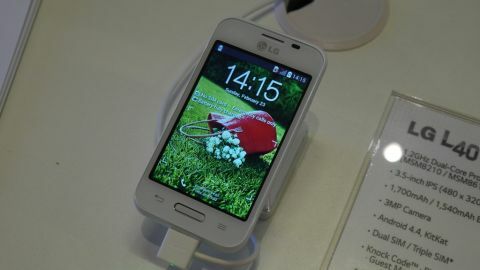 The LG L40 is going to have a low price tag, and that's made very clear by its style and screen. Still, with it rocking Android KitKat and actually performing pretty well the L40 could be the back-up handset to pick up on the cheap.